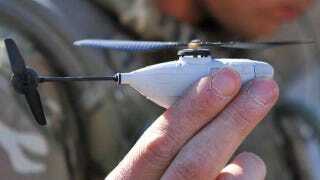 U.S. Army engineers are working on a mini aerial surveillance drone for troops working in challenging environments. Once deployed, the scifi-like device could allow soldiers to get a bird's-eye view of their immediate area, or scan the contents of a room as they clear a building. It's called the Cargo Pocket ISR, where ISR stands for Intelligence, Surveillance, and Reconnaissance. The device, which is being developed at the U.S. Army's Natick Soldier Research, Development and Engineering Center, will enhance the situational awareness of soldiers working on the ground by "providing real-time video surveillance of threat areas within their immediate operational environment." From here, the engineers are looking to redesign the digital data link to achieve compatibility with US Army standards, along with increasing its payload capacity so it can conduct low-light imaging (allowing for indoor and night operations). In addition, they'd like to improve its guidance, navigation, and control algorithms to allow the airborne sensors to operate in confined and indoor spaces, like when a solider advances from room to room as they're clearing buildings. "While the final system could be different from the surrogate system, NSRDEC is focused on proving the basic capability first," adds army.mil.